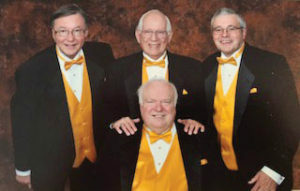 The Golden Oldies barbershop quartet produces joy for others while enjoying the music themselves. The Golden Oldies barbershop quartet: Vince Yinger, Eugene Lutz, Leland Braun and Dave Hammel. The foursome has won multiple awards and practices weekly at Grand View University as a part of The Pride of Iowa Chorus. The chorus collaborates with area schools to plan and conduct youth workshops attended by more than 1,500 high school singers. The four men — Vince Yinger, Eugene Lutz, Leland Braun and Dave Hammel — are not barbers, and neither are most other barbershop singers. “We are four guys who like to get together and sing,” says Yinger. The barbershop style of music — consisting of four vocalists, a lead, a bass and a tenor — is said to have originated in the latter part of the 1800s. No one knows for sure, but during the early years, before elevator music was readily available, it is likely to have primarily existed within barbershops. “It is a melody with three harmony parts,” says Yinger. And it is a cappella only, which means there are no instrumental accompaniments. The Golden Oldies aren’t professional musicians. This is a hobby, although they do sometimes get paid. They sing to produce joy for others while also enjoying the music themselves. Venues include nursing homes or other organizations that want a half an hour or so of clean, wholesome and quality entertainment. The Golden Oldies has won multiple awards as a unit. Individually, each is also accomplished. Lutz started quartet-ing in 1970. He has been performing for nearly 50 years. Hammel once performed at Carnegie Hall. Braun postponed his wedding to get a gig. And all of them have competed at the highest levels. Yinger has been barbershopping for more than half of a century. That span includes many highlights, but his time with a group called the Jurassic Larks produced some poignant moments. Each of the four Jurassic Larks dressed in a leisure suit while performing sketch comedy put to music. The group won the Barbershop Harmony Society’s 1998 International Seniors Quartet Champions. The performance was broadcast around the world. The awards at competitions are meaningful, but each of the four agrees that some of the less public moments will never be forgotten. After a show in southern Kansas, an elderly lady told Yinger that she lost her husband a few months prior. She had been devastated.